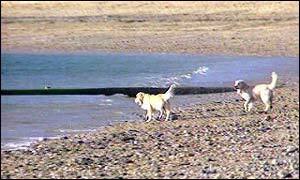 Three beaches in west Cornwall could be made dog-free zones if proposals before a council are approved. It follows an extensive consultation period by Penwith District Council with members of the public, parish and town councils and other interested parties. The authority is proposing to ban dogs from Porthgwarra, Porthchapel and Marazion. If approved, the ban, which would be in effect every summer, could start from April. In the Penwith district, there are 15 beaches where dogs are currently banned. The district has another 24 beaches where dogs are allowed. Penwith District Council's been considering the proposals for some time and consultations have been carried out to gauge public opinion on the move. Health, Safety and Transport Manager at Penwith District Council, John Tremelling said: "It started in summer 2000. "Questionnaires were given out to a cross-section of the public and other parties, including residents, councillors and lifeguards. "About 78% of respondents agreed dogs should be excluded from beaches and 68% said they wanted more beaches made dog free." The ban is not just being considered because of the question of dog fouling. John Tremelling said: "We have had a number of complaints from individuals, especially where visitors and young children go onto the beach and dogs out of control cause them concern." He continued: "But, of course, there's lots of other public land where dogs can go, as long as in any open land dog owners clean up after them." Members of the council's Social, Economic and Environment Committee are to meet in Penzance on Wednesday to discuss the proposals.